In SharePad you can click on Help and access a series of tutorials that give you an overview of the way the program works. This training zone article is designed to complement these tutorials, but also offer more detail than they are able to. In this tutorial we are going to look at the News in SharePad. 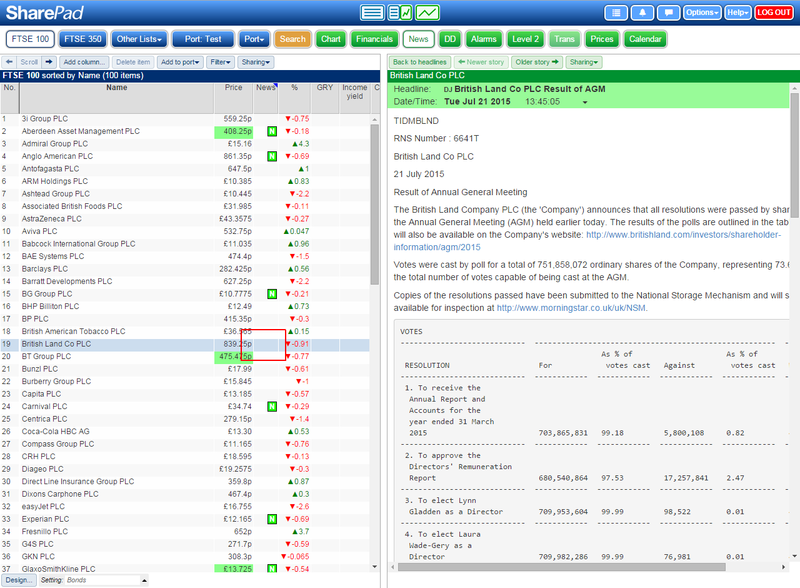 You access the News view in SharePad by click on the green News button on the main toolbar. 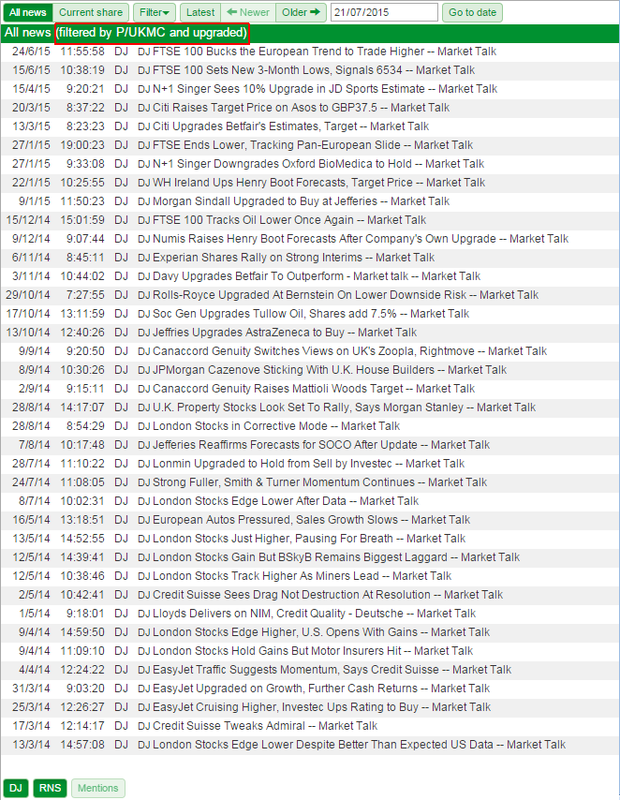 The news view, when you first look at it, will be set to show All News, this includes RNS news and news from our news provider; Dow Jones. At the bottom of the window you can select the option to view only DJ news stories, only RNS news stories or both. The Mentions option only works when viewing the news for the Current Share. At the top of the window you can work your way backwards through the news by clicking on the Older -> button. You can also set a date and then click on the Go to date button. You can move forward in time by using the <- Newer button. You can also jump to the present by clicking on the Latest button. If you select the Current share option then the news table will change to only show the news for that share. All of the standard options apply and you may notice that you can now deselect Mentions. Each news story is associated to particular shares by Dow Jones when they transmit the story. This determines if the News item appears for a particular share or not. Mentions goes one step further and scans each story for a mention of the share's name. If the share is mentioned in a particular news story then that story will also be shown in the list. Deselecting Mentions refreshes the news window and in most cases will change the list of news shown. Sometimes the change will be more or less noticeable depending on the number of stories that are listed based only on meeting the Mentions requirement. 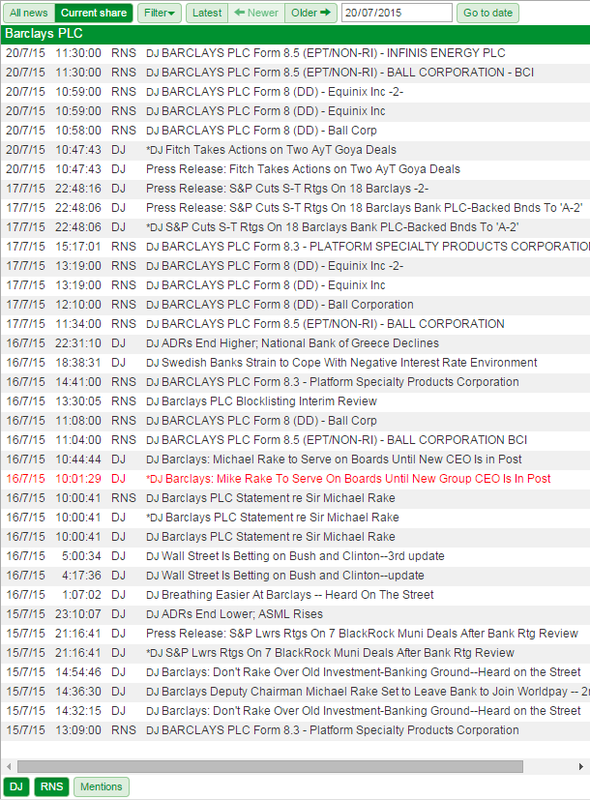 Here you can see that deselecting Mentions has changed the list of stories for Barclays quite considerably. 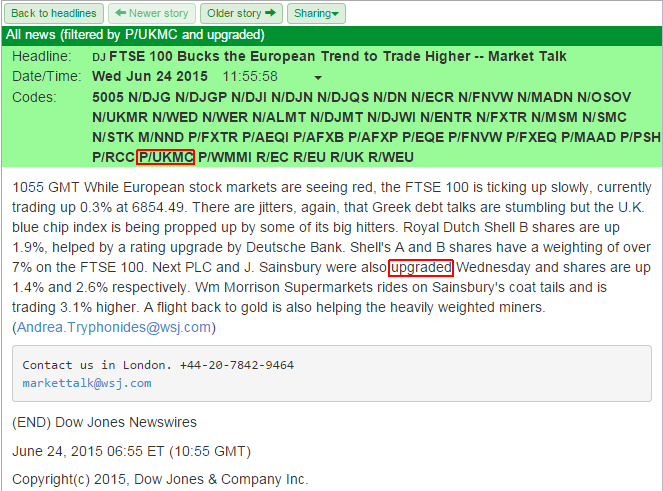 Note: News stories with red text are flagged by Dow Jones as "hot". This denotes that they are of greater import than normal stories. To view a news story all you need to do is click on the Headline for that story. Click on Back to headlines to return back to the list of news items. You can also step through the list of news stories using the Newer story and the Older story buttons. Filtering the news allows you to show all of the stories that are part of particular category; contain a particular phrase or combination of phrases; or stories that have been assigned a particular news code by Dow Jones. 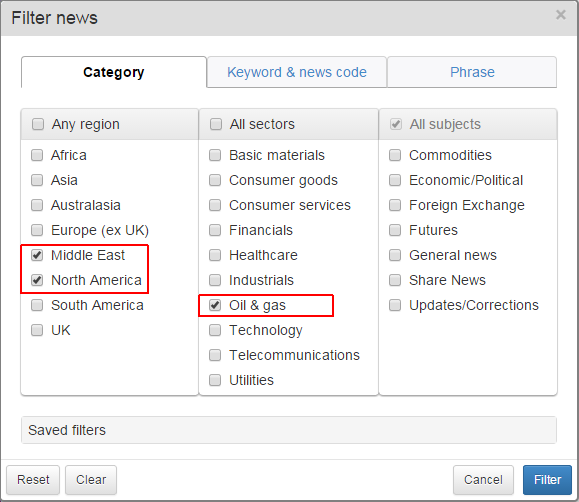 To filter the news select the Filter menu and then click on Set. The Filter news dialog will open. You can set a filter to show any number of the options shown on the Category tab. For example you might be interested in news regarding North America, Middle East and Oil & Gas. Note: for a story to be shown it has to be part of ALL of the categories that you have selected. Each news story is assigned one or more codes by Dow Jones when they issue the news story. 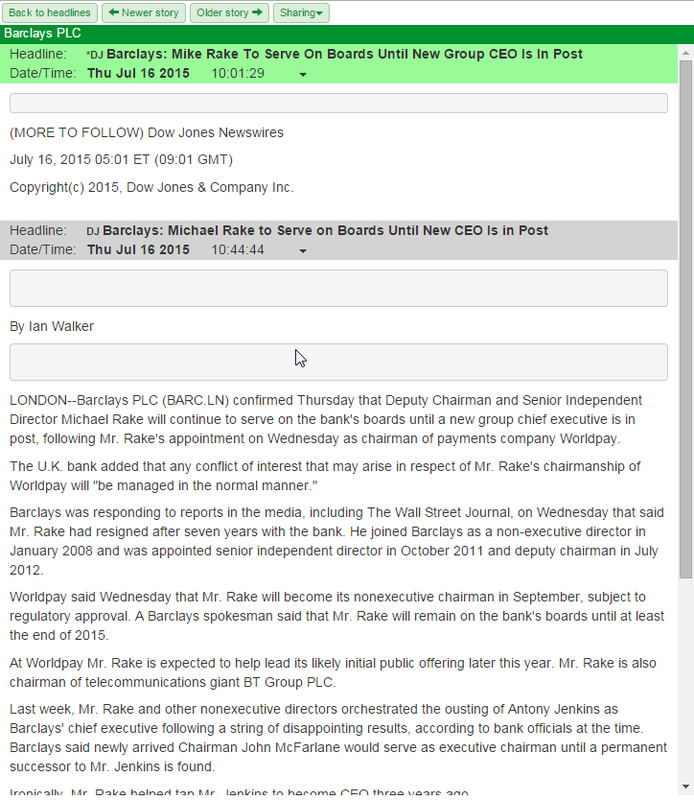 You can see these for an individual news story in SharePad by clicking on the little arrow to the right of the date and time on the pale green news story heading. It is possible to filter the news using these codes. When you start typing in the Phrase section of the Keyword & news code tab SharePad will automatically start showing you a list of codes based upon the phrase you have entered. 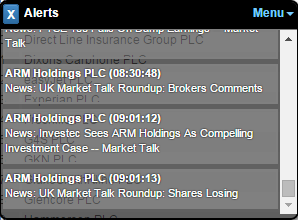 In this case you could select UK Market Talk Roundup: Broker Comments to show a list of these particular news stories. It is also possible to ignore the codes and just filter on a phrase. You have four fields available in which you can enter codes or phrases. These are combined so that the news stories shown must include all of the items you have entered. 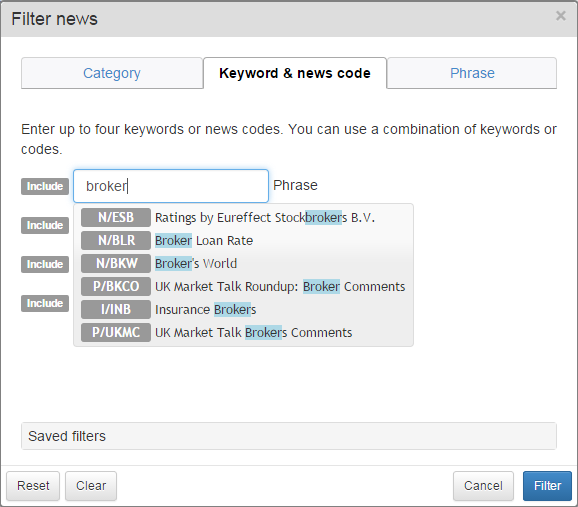 Here a filter has been created to show all the news stories with the code P/UKMC, this is the code for UK Market Talk Brokers Comments, and the phrase "upgraded". The phrase tab allows you to set a single word or phrase as your filter criterion. Here we have entered the phrase "profit warning". Only those stories where the phrase appears as written will be shown. Note: Phrase filtering is not case sensitive. Once you have input your filter details click on the blue Filter button. The news list will then be filtered by your criteria. 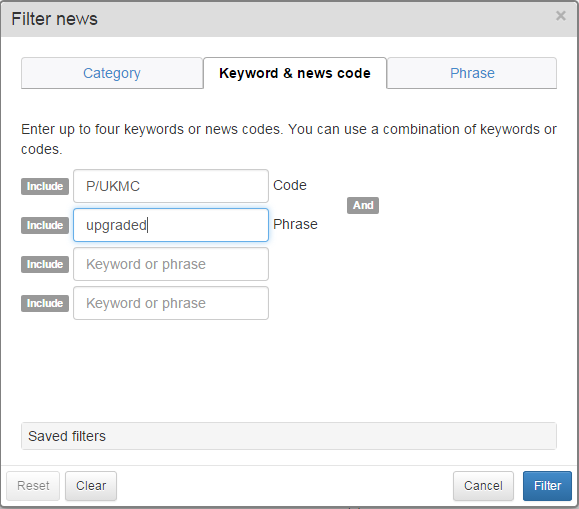 Here the news has been filtered by the key code P/UKMC and the phrase upgraded. You can see this is stated on the dark green bar at the top of the news window. This is the first story in the list and we have highlighted the news code and the phrase in the story to show how it met the filter criteria. 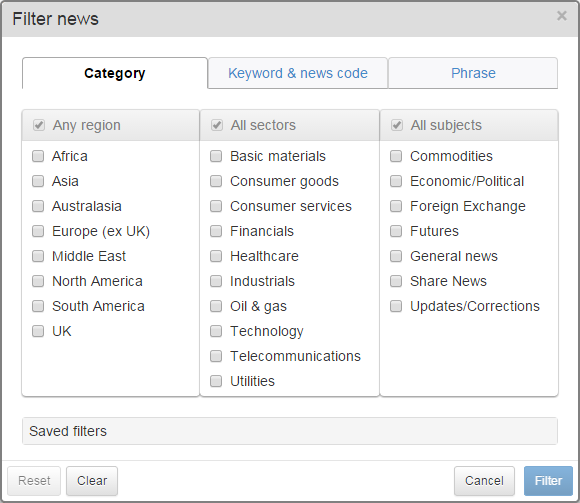 Once you have applied a filter to the news you can change or clear the filter by selecting the filter menu. At the bottom of the News filter dialog window is a button labelled Saved filters. If you click on this it expands the window to present you with the options to Save, Load, Delete, Duplicate and Rename a news filter. Here you can see the filter Upgraded Broker Forecasts has been saved already. This can then be loaded and applied to the news window. When you Save a news filter you are asked to give the filter a name. That name is then used when you apply that filter to the news list. When you Duplicate a filter you are also asked to give the duplicate a new name. Here we have duplicated the "Upgraded Broker Forecasts" filter and given it the name "Downgraded Broker Forecasts". Once you have duplicated a filter you will need to load it and make whatever changes you wish to make. Don't forget to save the changes. It is also possible to Delete or Rename a filter from this dialog. 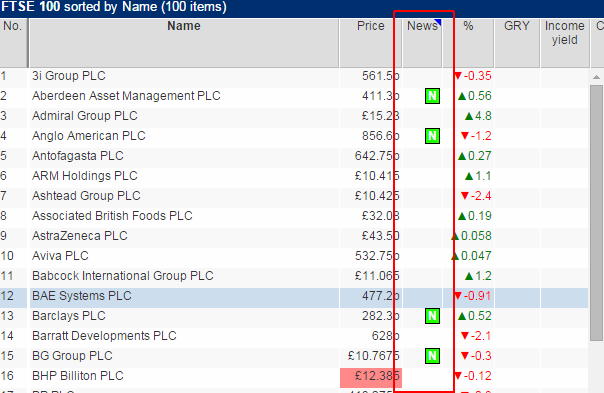 You can add a column to a table that shows if there are news stories for a particular share. Select the New flag option. This will open the News flag column dialog window. You can see that you can select to see unread stories today, in a specified period or any new within that period. Lastly, Include mentions can be set to yes or no. 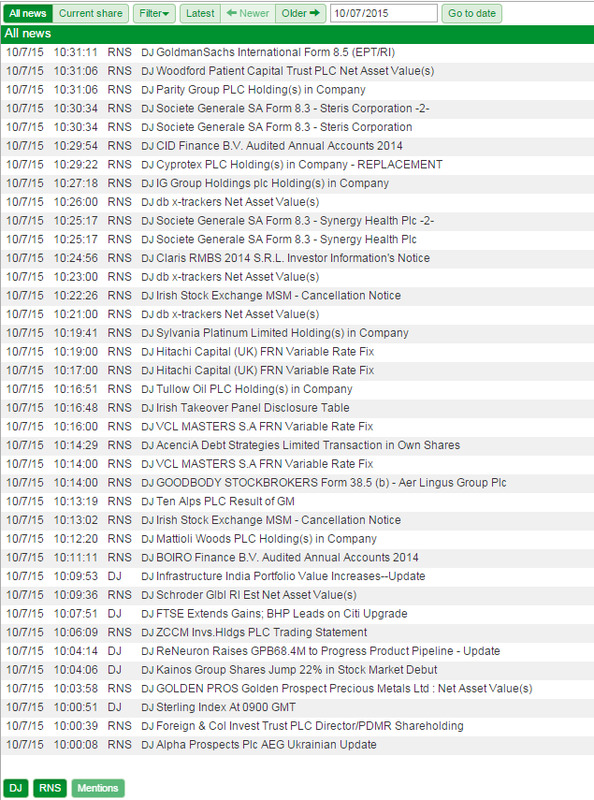 You could use this dialog to show you only shares that have RNS news stories today for example. You can see that the News heading has a little blue triangle in its top right-hand corner. This denotes that more information can be seen in a pop-up for each cell that has a flag. To access this you need to select the correct row and then click on the cell. 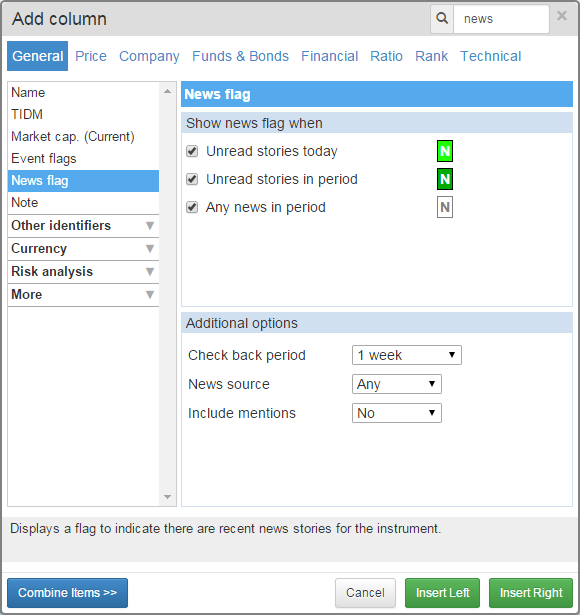 With both of the Green news flags once you have read the story or stories listed on the flag the flag will disappear. Should anymore stories be posted about the share during the day or subsequent days then the flag will return. The flags have an order of precedence in which they are shown. The order is Unread stories today (light green) -> Unread Stories in period (dark green) -> Stories in period (white). For more information about using Alarms in SharePad, please see the Alarms tutorial. 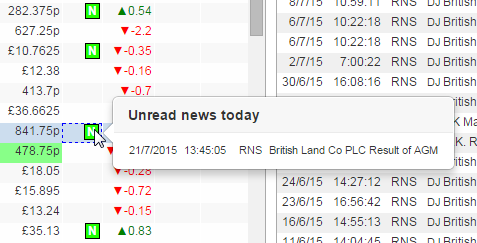 In SharePad you can set an alarm to notify you if a story has been released for a particular share. 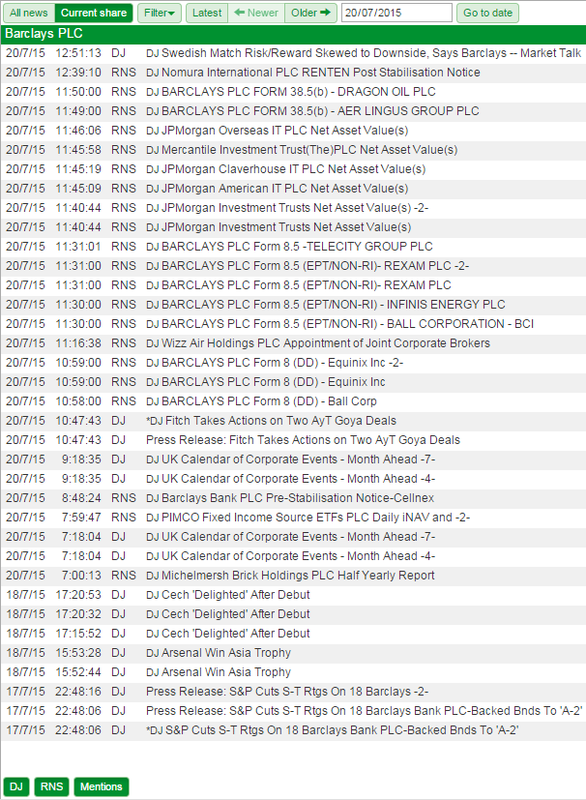 As you can see you can select between Any, RNS or DJ news stories and opt to include or exclude mentions of the company in any stories. If the alarm is triggered then a window, like the chat window, will open to notify you that this has happened. 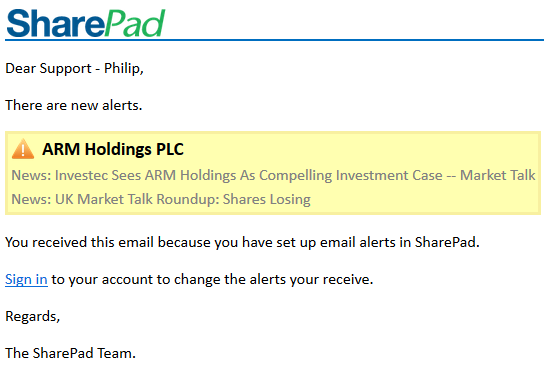 The alarms in SharePad can also be set to send you an email if the alert is triggered. You set this by clicking on the Envelope icon.